Lost Planet was all about the snow and ice. Lost Planet 2 mixes things up a bit with some jungle combat. But it wasn't until I checked out the Lost Planet 2 map pack Capcom is selling that the game hooked my interest. You get get the release day map pack for free if you pre-order the game from GameStop, but if you don't you're going to want to buy it. The pack features two maps: Helix and Back to the Island. While Back to the Island has some interesting map design, Helix is the true keeper here. In the underwater map you're playing inside an NEVEC mining facility packed with underwater vents that can shoot you up the column of the facility that makes up a bulk of the vertical map. 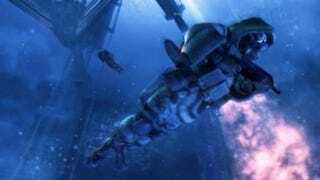 You can also swim around, board mech suits that convert to mini submarines and even find a tiny air pocket at the top for some above water battling. The ability to jump free of the facility's underwater gangplanks and walkways and swim around by mashing a button is a game changer on this map. It makes it nearly impossible to track where people are and make sure no one is sneaking up behind, above or below you. And those mech suits that change into subs, they're fantastic, allowing you to float around the facility unloading torpedoes into hiding enemies. Back to the Island isn't half bad either. The map is a relatively flat island with pockets of deep water you can slip into to swim around and use subs in. There's also plenty of space for the mech suits that convert into copters. Both maps support up to 16 players and hit the day Lost Planet comes to the PC, PS3 and Xbox 360 on May 11.